LOPHOPTERYS Adr. Juss. in Deless., Icon. Sel. Pl. 3: 18. 1838 ["1837"].—Type: L. splendens Adr. Juss. Dolichopterys Kosterm., Recueil Trav. Bot. Néerl. 32: 279. 1935.—Type: D. surinamensis Kosterm. 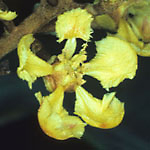 [L. surinamensis (Kosterm.) Sandwith]. Woody vines or shrubs (or small trees? ); stipules absent or vestigial, 0.2–0.5 mm long, borne on adaxial edges of petiole 1–2 mm above base; leaves opposite or subopposite; lamina densely and persistently sericeous below, mostly eglandular, occasionally biglandular on margin at base. Inflorescence paniculate, rarely simple, the flowers ultimately borne in pseudoracemes; bracteoles eglandular, the bracteoles borne at apex of peduncle when peduncle is developed; pedicels straight or slightly circinate in bud. Sepals mostly bearing a single, very large, circular or transversely elliptical, radially lineate abaxial gland on the lateral 4, the anterior eglandular (all sepals eglandular in some populations of L. inpana); corolla bilaterally symmetrical; petals bright yellow, glabrous or only very sparsely sericeous abaxially; stamens with filaments glabrous, longer opposite sepals, shorter opposite petals; anthers with the connective abaxially broad and swollen; ovary with the carpels distinct; styles inserted near apex of carpels, the anterior shorter than the posterior 2, the stigmas large, borne on internal angle of apex to nearly terminal. Samaras separating from a short pyramidal torus; samara bearing a relatively short, inequilaterally trapezoidal or flabellate dorsal wing with its greatest width toward base of nut and 2 long, narrow, forward-pointing, parallel-sided lateral wings 3 or more times as long as wide (except L. splendens, which has a very short dorsal crest and the lateral wings reduced to ridges or lost); intermediate winglets absent. Chromosome number unknown. Lophopterys is easily recognized in most cases by the combination of bearing only one large abaxial gland on each of the four lateral sepals and having two long narrow lateral wings on the samara accompanied by a relatively large trapezoidal dorsal wing. It does not much resemble Hiraea, having a very different inflorescence and the stipules vestigial or lost, but its placement in this clade is supported by the marginal leaf glands (if any) and the carpels distinct in the ovary. The two elongated lateral wings of the samara suggest the genus Tetrapterys, but other morphological characters do not support such a relationship, nor do DNA sequences. See additional discussion in the revision cited below. Reference: W. R. Anderson & C. C. Davis, 2001 (revision [pdf]). Etymology: The name Lophopterys comes from the Greek words for crest (lophos) and wing (pteron), referring to the mericarp of L. splendens, which lacks lateral wings and has only a reduced, crestlike dorsal wing.